This novel was the July pick for my reading group The Bookie Babes. Aside from a few details I liked it much more than the other reading group book this month, Little Fires Everywhere. It is one of those books spanning two time periods, one in the 1950s and the other in contemporary times. 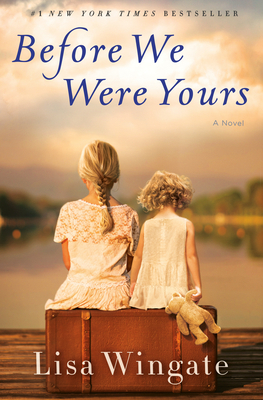 Orphans, adoption and family secrets make up the themes. If those two little blonde girls on the cover don't get to you, they will by the end. Whenever children become orphans and then get adopted, you have stories about birth parents, adoptive parents, and the kids floundering in between. Often there are secrets and in Before We Were Yours, you have a villain: Georgia Tann. She was a historical personage who kidnapped and sold poor children to wealthy families for over two decades from her Memphis-based adoption organization. Through numerous twists and turns, perhaps a few too many, everyone in the story finally learns who they were and how they became who they are. That is a happier story than most. My favorite character was Rill, one of the adoptees. She is the type whose loyalty, bravery and daring saves the day but who can never be sure until the day is saved. We had a deeply satisfying discussion, especially in these times of separated families and displaced children roaming the world looking for each other. It is enough to break our hearts on a daily basis and therefore good to have a story where people finally find each other. Glad you liked it more than Little Fires Everywhere. Dual timelines have become all the rage in historical fiction; oftentimes, one is better developed than the other. I find that authors usually give more of themselves towards the historical setting than the contemporary one; maybe it has to do with how into their research they got. Did you like one time setting more than the other? If so, why? Each time setting was well developed but I liked the historical part of the story better because the characters just came to life and that part of the story was more exciting. This sounds like a good read. I am glad you enjoyed it more than Little Fires Everywhere. There's been a lot of buzz about this book. The story it tells is certainly very timely. It sounds like The Bookie Babes were very positive about it. All three of the things you say are true! The book cover itself is enough to do me in. Glad relations are found in the story, hooray. I know right? That cover is a stunner.